There is a tendency to associate currency (in North America, dollar bills and coins) with the concept of "money." This is somewhat unfortunate, as currency is of limited importance for most developed countries, at least outside of the underground economy. Since the underground economy consists of activity that is precisely aimed to avoid interference by government (laws, taxes), it has limited effect on government finance under most circumstances. 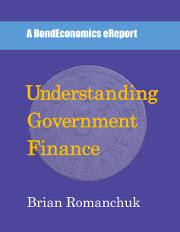 This article contains an excerpt from my eReport Understanding Government Finance. It explains how currency interacts with the rest of the financial system, based on what I refer to as the Simplified Framework of Government Finance (discussed in an earlier article). The Simplified Framework is based on the Canadian system of government finance, with a few simplifications. To briefly recapitulate the Simplified Framework, it is a system in which bank reserves do not exist. Since bank reserves have not yet been abolished in the United States, and most economic textbook writers are American, too much emphasis is placed upon the role of bank reserves in most descriptions of the financial system. Moreover, the "monetary base" consists of the sum of currency outstanding and bank reserves, which leads some analysts to treat bank reserves as somehow being interchangeable with currency. The beauty of eliminating bank reserves from the analytical framework is that such confusion is essentially impossible. The key assumption of the Simplified Framework is that in the absence of bank reserves, all net transactions at the end of the day between the government and the banking sector have to be settled with a transfer of government bills and bonds (since those are the only instruments that appear on the central bank's balance sheet at the end of the day). This assumption colours our analysis of the role of currency within the system. During the day, banks could have non-zero settlement balances, but those balances have to be netted out to zero by the close. Yes, the situation is slightly more complicated in the actual Canadian banking system, and those complications are addressed later in Understanding Government Finance. However, it is best to understand a simpler framework before attempting to deal with every possible complication that has been embedded within financial systems. The chart above illustrates the evolution of currency outstanding over time. Currency holdings decreased from over 4% of GDP in the 1960s to a value that has oscillated between 3% and 3.5% of GDP in recent decades. I have smoothed the currency series by averaging it over 3 months , as there are periodic spikes around December (reflecting higher holiday retail activity). Despite being smoothed in this fashion, the series still has a seasonal ripple. 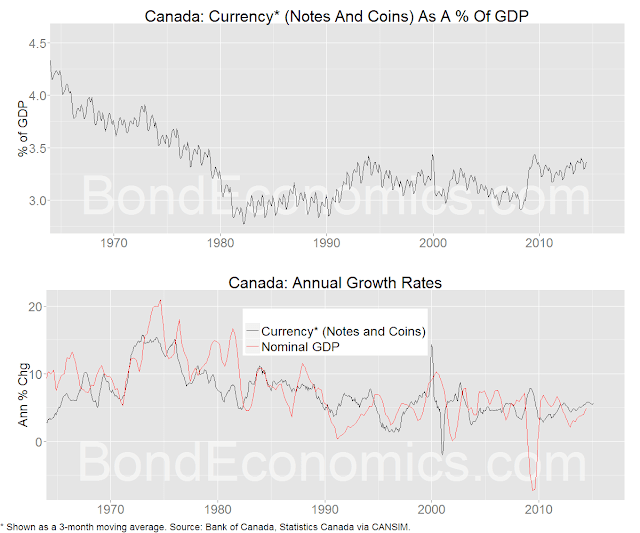 The bottom panel shows the growth rates for nominal GDP (Gross Domestic Product including the effect of inflation) and currency growth. There is obviously a slight relationship (as the ratio of the two series is stable), but there is little direct correspondence in the growth rates on a year-to-year basis. This type of behaviour is termed a stock-flow norm, as it appears that households want to keep their stock of currency holdings stable relative to the flow of their nominal incomes, but it may drift around this target ratio in response to events. The operations involving currency are straightforward. Although it is possible for citizens to pay taxes with currency directly, this appears to be an unusual occurrence. Modern Monetary Theory authors enjoy pointing out that when this is done in the United States, the government gives the taxpayer a receipt and then destroys the bills received. [*] This also provides an example of Chartalist principles: money has value to the citizen in that it they can use it to remove a tax liability, but it has no real value to the issuing government. Otherwise, transactions between the government and the banking sector involving cash revolve around the management of vault cash. Banks hold a certain amount of cash “in their vaults” and their automated teller machine network. Households typically withdraw currency from banks, which is then largely returned via retailers. Each private bank will have a circular flow of currency every day. Eventually, banks need to restock their vaults. To do so, they will need to buy currency from the central bank (as Canadian and most other private banks cannot issue their own banknotes). Within my simplified system of governmental finance, the bank would first incur a drawdown in its settlement balance with the central bank, which would need to be settled by selling some government securities to the central bank by the end of the day (assuming that the private bank did not have an inflow into its settlement balance from other transactions). This means that we can visualise the transaction as a trade of government bonds/bills for currency. The other side of this operation–private banks exchanging currency for bonds–is rarer as the stock of money follows an upward trend line, but it does happen when the demand for currency subsides in the new year. This used to be a topic of only academic interest until various European central banks set their policy rates to slightly negative levels. The open question is how much further they can lower interest rates until the private sector starts making large currency withdrawals, and stockpiling the cash. In summary, although negative interest rates are achievable, currency and other institutional factors will probably prevent interest rates from getting much more negative than -1% or so. Note: In a later article, I will turn to the more significant question of transactions between the private sector and the government which does not involve currency. Introduction to the Simplified Framework of Government Finance. "Modern Monetary Theory authors enjoy pointing out that when this is done in the United States, the government gives the taxpayer a receipt and then destroys the bills received. [*] "
I do not know why you seem to endorse this. You quote Warren Mosler in the footnote too. Nothing like that happens. Taxes paid with currency notes are not destroyed literally. Even if the notes are damaged, it is sent to the Federal Reserve. Nothing like the tax man throwing the cash in the shredder after the tax payer leaving the room happens. Damaged notes are retired regularly but that has nothing to do with taxes. I can go to a bank and exchange an old note for a new one and the bank will send it to the central bank which will reprint. The underlying point that the currency note is otherwise just worth the paper it is printed on and the one which gives it value is a social relation is fine. But I find the shredder bit hilarious. This is because people have all sorts of wrong notions about money and shouldn't be told something which doesn't literally happen to confuse them even more. I will admit that I did not check up on Mosler's story. 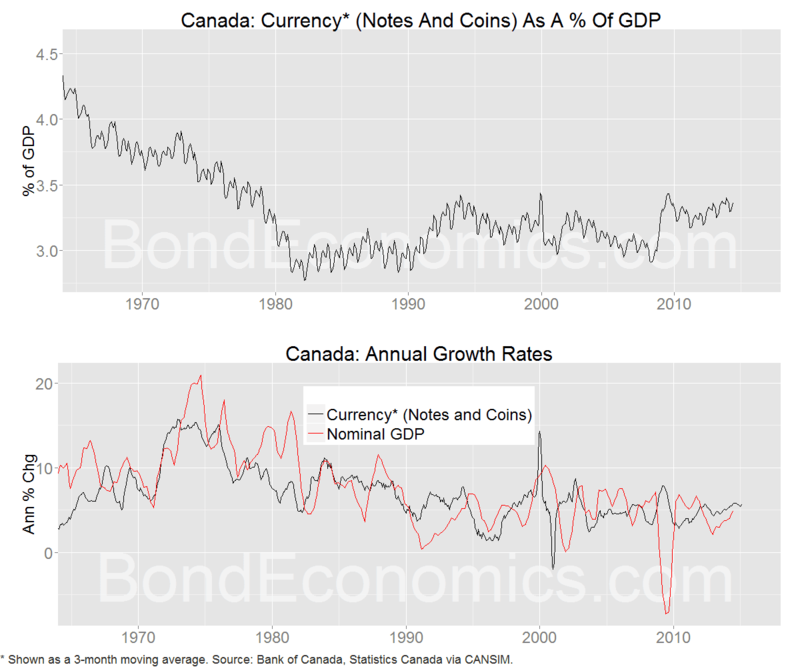 The Canadian government is more frugal and would probably attempt to recirculate the notes. Mosler presumably over-simplified the situation (I doubt that the same employee dumps the notes directly in the shredder), but the overall picture seems reasonable. Not many people pay income taxes with currency, and so there is probably limited mechanisms for currency re circulation from that office. The path of least resistance is to treat the notes as damaged, and take them out of circulation. Which means they ultimately get shredded. The problem here is failing to separating the note from the liability behind it. A bank note is just a receipt for money. It isn't the actual money. There are times when a receipt is a receipt for something and a time when it is just a piece of paper. Once taxes are paid - and the liabilities of the central bank represented by the note transferred to the Treasury - the bill becomes just a piece of paper again. And it remains a piece of paper until it is reissued as a receipt for some central bank liabilities. The form of paper recycling used is merely a facilities matter. You can shred and print new, or you can collect them up and transport them to a note collator. So here we have evidence of the government literally spending by printing money and taxing by unprinting money. Remember the US Dollar is widely used internationally Brian and currency is often used in this case. That's somewhat of a special case of the "underground economy." It may matter for the other economies, but it has no direct effect on the U.S. domestic economy (other than possibly creating demand for the U.S. dollar). It does increase seignioriage "revenue," but that is a fairly steady effect.